France was one of the earliest European nations to engage in the Newfoundland and Labrador migratory fishery and dominated the industry throughout the 16th and 17th centuries. Its first documented fishing vessel crossed the Atlantic in 1504 and many more followed suit over the next 400 years. France supported its migratory fishery for two major reasons: it was of tremendous economic value and provided a reserve of experienced sailors for the French Navy, which helped to maintain the country's status as one of the world's great maritime powers. France was one of the earliest European nations to engage in the Newfoundland and Labrador migratory fishery. Watercolor. Artist unknown. "French Fishing Boats." Courtesy of Library and Archives Canada (Acc. No. R9266-554.12) Peter Winkworth Collection of Canadiana. French merchants directed the industry and recruited workers each winter to sail overseas and engage in the migratory fishery. During the 16th and 17th centuries, French fishers worked in southern Labrador and on Newfoundland's south, west, and northeast coasts. Their access to the colony changed after the 1713 Treaty of Utrecht, which limited French use of Newfoundland to between Cape Bonavista and Point Riche on the north shore. In the coming decades, warfare in Europe and a sting of Anglo-French treaties and agreements further altered French involvement in the fishery. France was the most important participant in the transatlantic fishery for much of the 16th and 17th centuries – it sent more ships overseas than other nations, harvested more fish, and maintained a near monopoly of Newfoundland's south, west, and northeast coasts. A variety of factors contributed to France's early dominance: its seaports were geographically close to Newfoundland and Labrador, it had a large domestic market for saltfish that local fisheries could not easily satisfy, and its involvement in the North Sea cod fishery meant it already had the technology and ability to catch and process cod. Map of New France, n.d.
Map shows inset images of inhabitants at work (fishing and hunting) and at play (socializing and dancing). Fishermen in boats and sea creatures can be seen in surrounding waters. Artist unknown; place and date of creation unknown. Courtesy of Library and Archives Canada (Acc. No. R9266-4038). Most fishers came from either Brittany or Normandy, which were located on France's northwest coast and therefore ideally situated to exploit Newfoundland and Labrador fishing grounds. Some also came from La Rochelle and other areas on the country's west coast, while Basques fishers and whalers from southwest France also migrated to Newfoundland and Labrador. 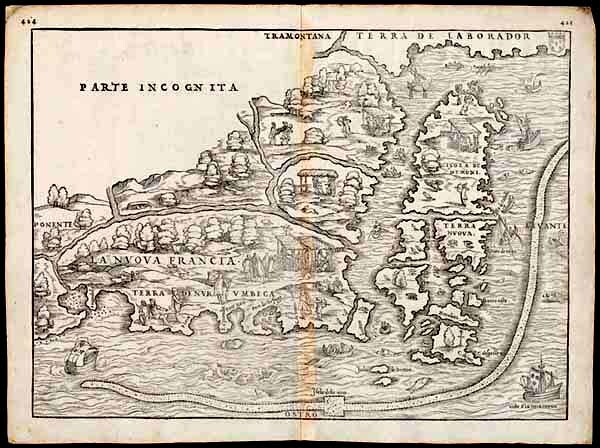 The first documented Breton fishers arrived in 1504; within four years, both Breton and Norman vessels were regularly crossing the Atlantic in increasing numbers. French ports were annually dispatching between 60 and 90 vessels by the 1520s and the industry steadily grew in the coming decades. Merchants located in Normandy, Brittany, and the Bay of Biscay recruited fish workers from nearby villages each winter to cross the Atlantic. Most fishers engaged in the shore fishery departed in April and returned in the fall, while those prosecuting the bank fishery sometimes made two annual voyages – one in January or February and a second in April or May. French fishers landed at many Newfoundland and Labrador ports. Normans generally worked along the island's south coast, while Bretons were active on the north coast as well as in southern Labrador; vessels from both regions also fished on the Grand Banks. Basques fishers worked along southern portions of the island and Basques whalers arrived at southern Labrador to hunt right and bowhead whales in the Strait of Belle Isle; depleted stocks, however, forced this industry into decline by the early 1600s. Fishers from La Rochelle, meanwhile, often worked from St. Mary's Bay on the Avalon Peninsula's southern shore. 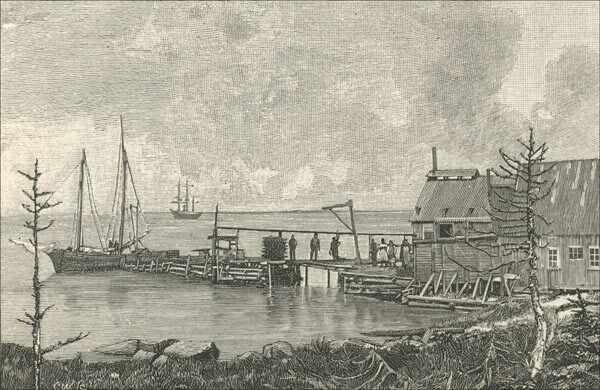 Upon arriving at Newfoundland and Labrador, workers spent much time building or repairing various shore structures needed for the fishery. 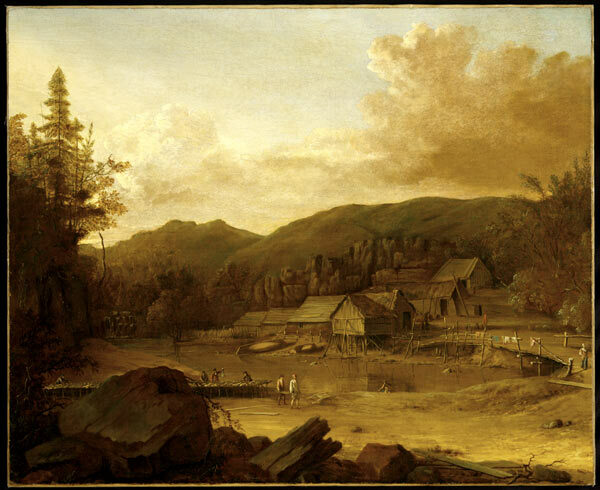 These included stages (a wooden shed and wharf where fishers stored salt and prepared fish), cabins, cookhouses, storage facilities, and outdoor bread ovens made of brick or stone. Fishers remained overseas for about five months, during which time their diets consisted largely of fish, fresh bread, and foodstuffs imported from France – coffee, dried beans, lard, biscuits, salt meat, and live poultry. Fishers spent the bulk of their time at Newfoundland and Labrador catching and processing cod. The French employed both a wet and dry cure of codfish. The former involved heavily salting cod or packing it in brine, while the latter allowed lightly salted fish to dry outside, through exposure to sun and wind. The French generally favoured a wet cure, but the Basques fishery and parts of the Breton and Norman fisheries were dry. Merchants tended to sell the wet cure on French markets and dry cod to buyers in southern Europe. Alongside migratory fishers, smaller numbers of resident French fishers were also active on the island of Newfoundland during the second half of the 17th century. Most lived at the French colony of Plaisance (Placentia) on the Avalon Peninsula's southwest coast, although others worked elsewhere on the island's north and south coasts, in such places as St. Mary's, St. Lawrence, Fortune, Burin, Paradise Sound, Gaultois, Grand Bank, Trepassey (which had a mixed population of French and English), Hermitage Cove, Mortier Bay, Merasheen, and Harbour Breton. Painting by Gerard van Edema (Dutch, c. 1652-1700). Oil on canvas c. 1700. 957.91. Courtesy of the Royal Ontario Museum, ©ROM. French migratory and resident fisheries prospered in the final decades of the 17th century. France's fleet was almost twice the size of England's and numbered roughly 360 vessels carrying up to 20,000 fishers each year. However, a series of wars and treaties between France and England in the 18th and 19th centuries dramatically limited the nature and location of French activity on the island of Newfoundland. 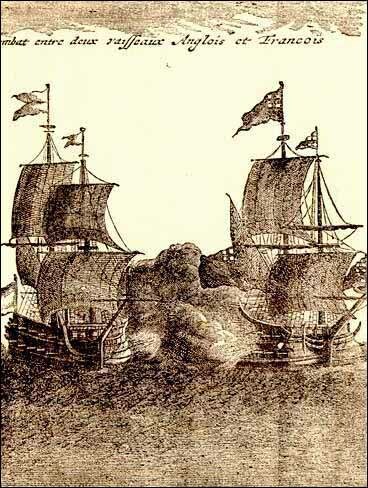 An English and a French Warship in Battle, n.d.
A series of wars and treaties between France and England in the 18th and 19th centuries limited the nature and location of French activity on the island of Newfoundland. From D.W. Prowse, A History of Newfoundland from the English, Colonial, and Foreign Records, 2nd edition (London: Eyre and Spottiswoode, 1896) 212. The earliest restrictions followed the War of Spanish Succession (1702-1713), in which England and its European allies forced France to withdraw from the Spanish Netherlands and the Spanish possessions it had seized in Italy. The Treaty of Utrecht helped end the war in 1713 and stipulated, among other things, that France surrender some of its North American territories to Great Britain. The treaty granted sovereignty of Newfoundland to England and forbade permanent French settlement of the island. It did, however, allow France to use a portion of the north coast, between Cape Bonavista and Pointe Riche, as a seasonal base for its fishery. French fishers were allowed to catch and dry fish in this area, known as the French or Treaty Shore, but had to leave once the fishing season ended in September. The Treaty of Utrecht provided that the French could fish in season on the Newfoundland coast between Cape Bonavista and Point Riche. Plaisance became an English colony as a result of the treaty and French settlers living there could only remain if they swore an oath of Allegiance to the Queen of England. Some complied, but many did not and chose to instead move to the French-controlled Île Royale (Cape Breton) or elsewhere. Île Royale replaced Plaisance as France's major centre for military and commercial activity in North America. It also provided a base for French fishers during the off-season. This changed in 1763, when the Treaty of Paris stripped France of Île Royale and placed it under English control. The treaty ended the Seven Years' War (1756-1763), in which British forces successfully seized many French colonies in North America, the West Indies, and elsewhere. Although France surrendered most of its North American territory to Britain in 1763, the Treaty of Paris allowed the country to retain seasonal fishing rights to Newfoundland's French Shore and permitted it to use the archipelago of St. Pierre and Miquelon as a fishing base in compensation for losing Île Royale. The 1763 Treaty of Paris allowed France to use St. Pierre and Miquelon as a fishing base in compensation for losing Île Royale. Photo by Paul-Émile Miot. Courtesy of Library and Archives Canada (PA-194625). French fishers largely avoided the island of Newfoundland during the Seven Years' War and upon their return found that English settlers and fishers had moved into the eastern portion of the French Shore between Cape Bonavista and Cape St. John. 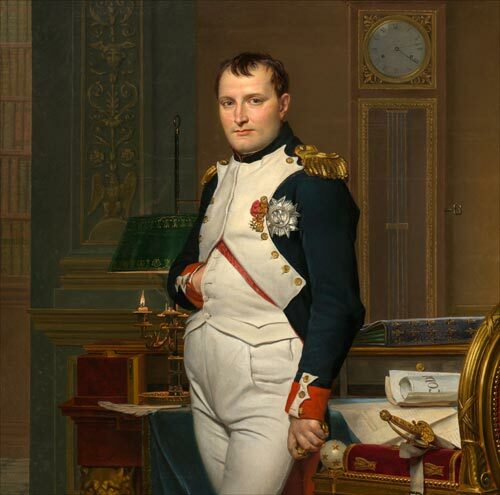 The development created tensions between the French and British governments: France argued its rights to the Treaty Shore were exclusive, while Britain maintained both countries had concurrent rights to the shore. 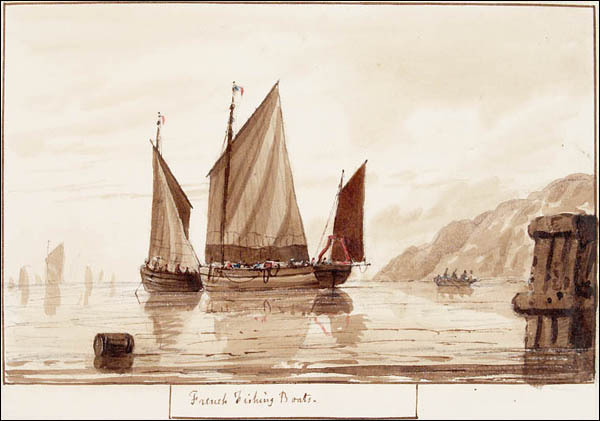 The dispute was never resolved and both French and English fishers continued to exploit resources along the Treaty Shore. Warfare again disrupted the French fishery during the American Revolution (1775-1783), in which France sided with the American colonies against Britain. The 1783 Treaty of Versailles helped to end hostilities and shifted the boundaries of the French Shore west, to Cape St. John and Cape Ray. This gave French fishers use of the Northern Peninsula and the island's west coast, while the English gained full possession of Bonavista and Notre Dame Bays. The treaty also reconfirmed French possession of St. Pierre and Miquelon and forbade English fishers from “interrupting … by their competition, the fishery of the French” at Newfoundland. In the Treaty of Versailles (1783) between Britain and France, the boundaries of the Treaty Shore were changed to Cape St. John and Cape Ray. The French Revolution (1789-1799) and Napoleonic Wars (1803-1815) again forced France to suspend its migratory fisheries at Newfoundland. 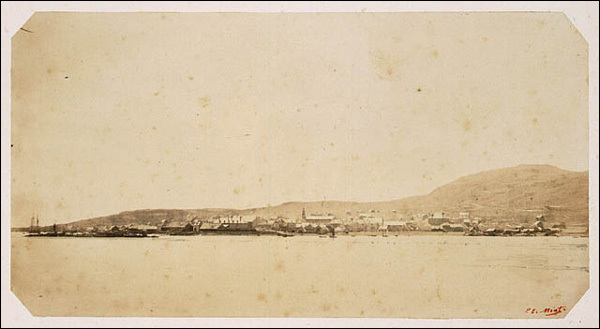 The French resumed fishing operations along the Treaty Shore after 1815, but found that Newfoundland had undergone many social, political, and economic changes during their decades-long absence. The French Revolution (1789-1799) and Napoleonic Wars (1803-1815) forced France to suspend its migratory fisheries at Newfoundland. Competition for space and maritime resources along the Treaty Shore was a source of tension between French and resident fishers for much of the 19th century. French fishers objected to the spread of English settlers along the northeast coast and to the growth of Codroy and other western settlements. The French forcibly evicted some resident fishers from the Treaty Shore after 1815, which generated widespread resentment among the islands permanent population. Competition for buyers on the international saltfish market was another source of conflict. The French cod fishery at Newfoundland enjoyed much prosperity from 1815 until the 1830s, due in large part to bounties the French government paid its fishers, which allowed them to sell cod at rebated prices. Newfoundland and Labrador fishers received no such government subsidy and found it difficult to compete with lower-priced French fish at the marketplace. An emerging lobster fishery along the Treaty Shore during the late-19th century further inflamed tensions. By the 1880s, American, Nova Scotian, English, and Newfoundland merchants and fishers had established a string of lobster factories along the Treaty Shore, which employed a significant number of local residents. "Messrs. Forest and Shearer's Lobster Factory, Brig Bay, N.W. Coast"
Brig Bay is on the west coast of the Great Northern Peninsula, south of the Strait of Belle Isle. Engraved by C. Weithas, 1891. From Black and White, "The Newfoundland Fisheries Question," May 2, 1891, p. 393. Reproduced by permission of Kurt Korneski. © 2019. The French government complained to Britain that the factories and lobster fishery violated their treaty rights and interfered with the French fishery at Newfoundland. At the same time, French fishers were also engaged in a smaller scale lobster fishery and had established their own lobster factories on the Treaty Shore. The British government argued that while France had the right to catch and cure fish at Newfoundland, it did not have the right to harvest lobster. 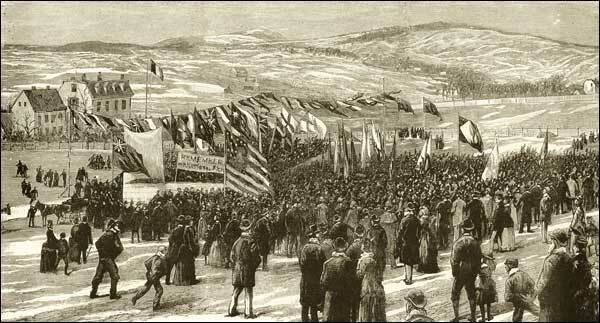 An illustration of a demonstration in St. John's against French fishing. The heading under the drawing read "The Fisheries Question in Newfoundland. Demonstration against the French Fishing in British Waters". From the Graphic Newspaper Vol 41, 1890. Reproduced by permission of Kurt Korneski. © 2018. By then, however, the French cod fishery at Newfoundland had fallen into decline. French merchants increasingly prosecuted the St. Pierre-based bank fishery and the number of fishers migrating to Newfoundland steadily decreased from more than 10,000 in 1828 to roughly 291 in 1898. France' centuries-old involvement in the Newfoundland and Labrador fishery came to an end in 1904, when it abandoned all claims to the Treaty Shore under the Anglo-French Entente, or entente cordiale. The agreement allowed France and England to resolve outstanding colonial disputes and stipulated that France surrender its territorial and fishing rights at Newfoundland in exchange for British territory in Africa. After 1904, France based its North Atlantic fishing operations at St. Pierre and Miquelon instead of the island of Newfoundland.